As the summer wound down, most of the bright spring flowers were gone and the autumn flowers were yet to be in full bloom. But variety could still be found in the reflecting pools and small ponds where water lilies continued to display their colors, some during the day and others at night. The best time to photograph the lilies was the early morning when the night flowers had not yet closed and the daytime flowers were just beginning to open. 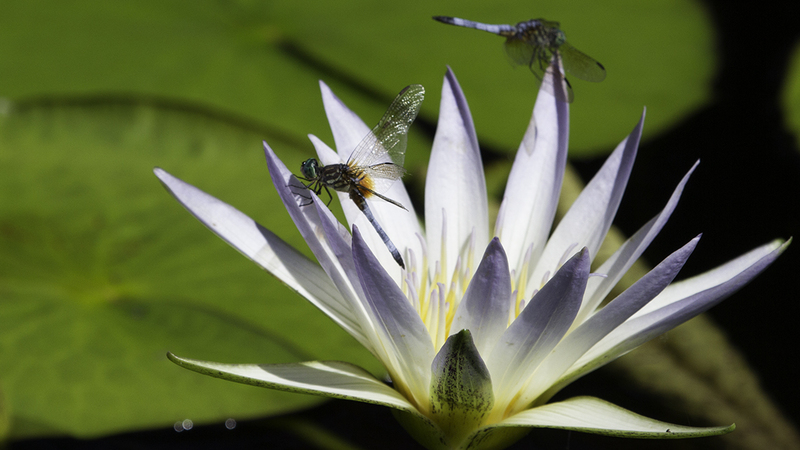 In addition to photographers, the lilies also tended to attract the dragonflies, like the two perched on this blossom which also became much more prevalent in late summer and early autumn. Soon the lilies, too, will be gone for another year and the Botanical Garden will go into a few months where colors are rare and it revitalizes for the next year.